I remember growing up as a little girl. My mother used to make eggs and pumpkin leaves almost every weekend. And I always enjoyed it. 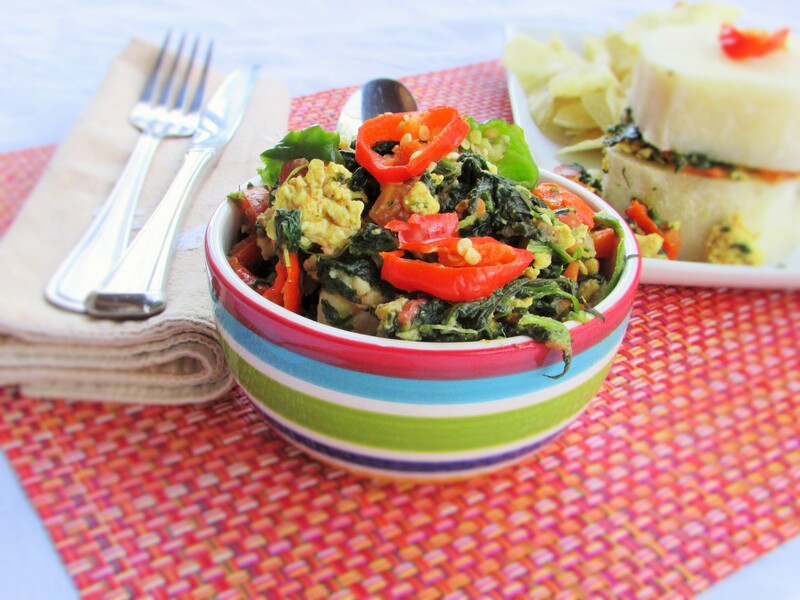 It made for the perfect breakfast along with some yam, potatoes, plantains or toast. Well, it was a cool evening in my neck of the woods and my ajebutters wanted breakfast for dinner, so I decided to whip up some eggs and vegetables. Although I did not have the pumpkin leaves, some spinach worked great. Give it a try, it is easy, and tasty and will leave you quite satisfied. This entry was posted in Appetisers, Appetizers, Beans, Beef, Beef suya, Breakfast, chicken, chicken dishes, chicken stew, chicken suya, Eggs, fish, Frejon, jollof, Jollof rice, Jollof spaghetti, Lunch, Nigerian soups, Rice, Sauces, Small chops, Snack, Soups, stew, Stews, suya, Swallow and tagged breakfast eggs, eggs, eggs and spinach, eggs and ugu, eggs and vegetables, eggs and veggies.